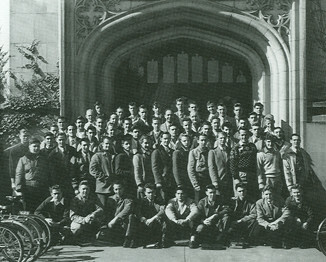 Although there were a few veterans admitted to Vassar during the C term of 1946, it was in September of 1946 that Vassar opened its doors to the largest group of veterans of World War II. This was done by many, if not all, of the women’s colleges in New York State to ease the emergency caused by the return of so many men looking to continue their education. During this first year, the expectation was that we would take the credits earned and transfer to another college. There were over 300 men seeking admission to the program, but only 94 were accepted. However, during our Freshman year, arrangements were made with the University of the State of New York -- now the State University of New York -- that allowed the Veterans Program at Vassar to be expanded to graduation, effective at the start of our Sophomore year. The degree was given by the University of the State of New York to all men having satisfactorily completed the prescribed course of study --- the same requirements applying to the female students. The Poughkeepsie Sun (September 15, 1946) reported that 47% of the men had served in the Army, 34% Navy, 15% Air Corps, 3% Marines, and one person in the Royal Canadian Air Force. We were all day students, living off campus. Most of us had served 3 or 4 years with ranks ranging from Private to Major. Most of us were non - commissioned officers. Our average age in 1950 was 23. Thirteen of the 94 were married. Very few of us stayed the full four years at Vassar. Others transferred to other institutions as openings occurred. Those who did stay at Vassar earned their degrees from the University of the State of New York, as previously mentioned. At the start of our Freshman year, we met with Chaplain Charles McCormick, who told us if there were any “male / female problems,” the girl would be dismissed and the entire Veterans Program would be eliminated! There was only one indiscretion -- in 1949. As I recall, both the girl and the Vet were dismissed from Vassar but, much to our relief, the Veterans program was not eliminated. The men, however, were banned from the girls' rooms during the usual afternoon hours. Two sisters, with whom a few of us spent Saturday afternoons studying and listening to the opera, were outraged. They strapped on their armor, went out and did battle with the powers involved, and emerged victorious! The ban lasted perhaps two weeks. There was much bitterness among many Vets over the attitude of Vassar’s Administration, which was interpreted as not welcoming. By and large, the female student body embraced (figuratively speaking) the Vets with a degree of reservation, but always with cordiality. The faculty welcomed us into their classes. They felt as though we were able to add a lot to classroom discussion, stimulating the thinking among students who had not had the maturing experiences we had had. Years later, I was told by several Professors, in separate conversations, that the success of the Veterans Program was one of the factors leading to the college going co ed. Interesting enough, however, in all of the printed history of the decision making process, including internal memos, the Vets are not once mentioned. Consequently, I donít know if these Professors had a part in the process, whether this information filtered down to them, nor do I know the degree of importance our Program played. I just feel a degree of satisfaction that the Veterans Program was ultimately appreciated. In 1972, Vets who had earned the University of the State of New York degree at Vassar were offered a Vassar A.B. as well. Those men were; Themistocles Z. Aposporos, Jacob B. Berlin, Edward L. Brady, Carmine Calenti, Joseph U. Damico, Herman Quimby Heotzler, Kenneth Kaeli, Ralph LoCascio, William McCord, Morris J. Padovani, Jonathan Avery Slesinger, Peter Theodoropoulos, Otis Howard Winn, and Rinaldo D. Zarra. Another Vet, Robert Ticehurse, received the State diploma but died before Vassar offered its A.B. to the Vets. Among my Vassar memories, I must mention Professor C. Gordon Post. Gordon and I shared the male leads in the play “Alcestis”at Avery in 1948. We developed a great relationship during those long weeks of memorization and rehearsal. He was Heracles and I was Admetos. Years later, some forty plus, I ran into him for the first time since my student days. I introduced myself as Admetos and was taken by his surprised and pleased reaction. We had a great chat and talked about the play. I told him it was a great experience for me, and I only had one regret. That was that I never received any of the formally posed photographs that were taken during dress rehearsal. I think I was out sick when the cast signed up for the pictures. In retrospect, I can still see his intent gaze as I told him this. Not too long after this chance meeting, a padded manila envelope arrived at my home and in it was a photograph of Gordon and myself in costume, on stage in front of the set. A wonderful gift from a thoughtful man. Shortly after that, Gordon passed on and the Vassar community lost a giant in more ways than one. Heracles, rest in peace. As an economics major, I must also comment about the Economics Department faculty, all women. I, very fast, grew to admire the intellect, the knowledge, the commitment of these ladies, as well as their drive to make us knowledgeable. I must end with a big “thank you” to all the gals and guys I knew during those years. Friendships were made that are still pleasant to think about as an old married man. We’ve all gone our own ways, established our own families, but to the gals and guys of Vassar, a heart felt thanks for the memories, and to Vassar College itself, thanks for a superb education! This is an edited version of the article by Forrest L. Cousens '50 originally appearing in the 50th anniversary book of the Class of 1950.